Our General Type Stickers have been tried and tested for over 7 years now. They are Waterproof, UV Resistant and Sctratch Proof. The Print is heated onto the Self Adhesive Backing, and creates the quality with the stickers. The Sticker is then peeled away from the Backing Sheet, and applied to your surface. The Stickers can be applied to most clean, dry, flat surfaces, including: Glass, Plastic, Metals and some woods. Our standard single colour stickers are printed digitally, with a 200dpi printer using foil print. Images are converted into a 200dpi image, single colour for printing, so please allow for a little loss of quality. The print is printed onto the non sticky side of a high grade 3 year Vinyl. The print is water proof, and will not fade in sunlight. The adhesive on the stickers is stronger than standard 'self cling' stickers, so stay in place until removal is required. All stickers are checked before dispatch, for imperfections in print quality. Some small dots of misprint may be detected, but there will be no more than 2 on a sticker, and will be no more than 1mm square. 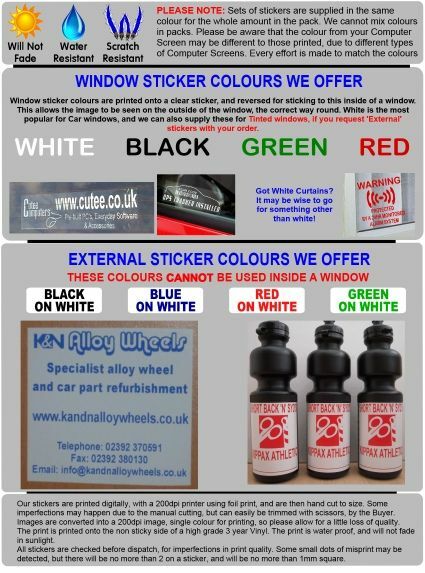 Please read the attachment instructions, that are supplied with the stickers, to apply them correctly. You must only use clean hands to apply the stickers, and in no circumstances must any other tool be used. The print is durable to normal weather conditions, but parts may wipe off if chemical cleaners are wiped over them. If the stickers are left as applied, you will have no trouble with them. The best way to remove self-adhesive vinyl is to use heat (although stickers applied to windows will normally peel away nicely) this is a MUST for removing from vehicle bodywork. Either a hairdryer or an heatgun can be used to create temperatures of at least 20 degrees Celsius, but care must be taken not to actually melt the vinyl. It should be heated so that once softened the corner can be lifted enough to start gently peeling back at a 180 degrees angle, and slowly removed. Never pull the film towards yourself at a 90 degree angle, always peel flat along the substrate at a 180 degree angle to prevent damage to the surface underneath. Once the vinyl has been removed it will probably be necessary to remove some residual adhesive. Any residual adhesive can be removed with normal cleaner used for the surface applied to. We cannot be held responsible for any damage that may occur upon the removal of stickers from any surface. If you have purchased custom stickers, please send the details that you require on your sticker as soon as possible, or this will delay the dispatch of your item. We will attempt to contact you to find out the details you require. No refunds can be entertained if you are on a timescale, and details are not given, as it is up to you to provide us with the details. You can send the details via your PayPal payment, through eBay messages or via email to info@platinum-place.co.uk . Please note: Any products displayed on security stickers are fictional, and do not exist. Any website links act as an extra deterrent tool, but are also fictional. Platinum Place are working to stop crime and the products we supply are simply acting as a deterrent. Unfortunately, you will never be 100% secure, but we hope this helps. Platinum Place has no responsibilty to the buyer if the deterrents do not work. By purchasing our stickers, you are accepting these terms and conditions. We cannot accept returns for Custom Printed Stickers, if the problem is no fault of ours, as they are specially printed for Buyers. We cannot accept returns for used stickers, Stock or Custom Type.